Clifton Forge, VA (Se0pt. 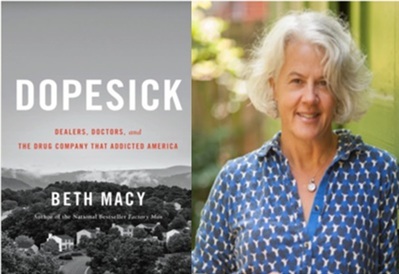 10, 2018) - The public is cordially invited to spend an evening with noted author Beth Macy. Sponsored by the Clifton Forge Public Library in partnership with the Historic Masonic Theatre, the program will be held in the Theatre’s Thomas P. Dean, Racey and Dean Inc., Underground Lounge and Cafe. It will begin at 7:00 p.m. on Monday, September 24. Admission is free. Macy’s first book, “Factory Man,” is now in development to become a film with Tom Hanks playing the title character. Her second book, “Truevine,” is also in the developmental stage for becoming a movie. Macy has won more than a dozen national journalism awards, including a Nieman Fellowship for Journalism at Harvard in 2010. She has written for online journals, radio, and magazines, including “Oprah Magazine”, “Parade”, “The New York Times”, “Salon”, and “Christian Science Monitor”. Beth Macy’s program will conclude with a book signing. Copies of her book will be available for purchase. The Masonic Underground is located at 510 Main Street.